Directions: Click on the preview above to download the print friendly version of this coloring page. We’ve also uploaded a higher resolution jpeg image for advanced users. This free coloring sheet continues our series of illustrations about the Fruit of the Spirit. Don’t miss all our free lessons based on this passage. 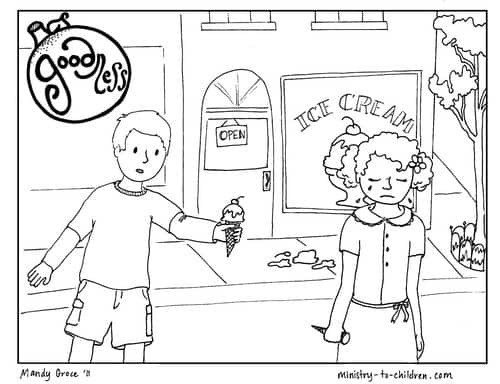 In this picture, a young boy is sharing his ice cream with girl who has dropped her own. This is a contemporary way to explain goodness in terms kids will easily understand. 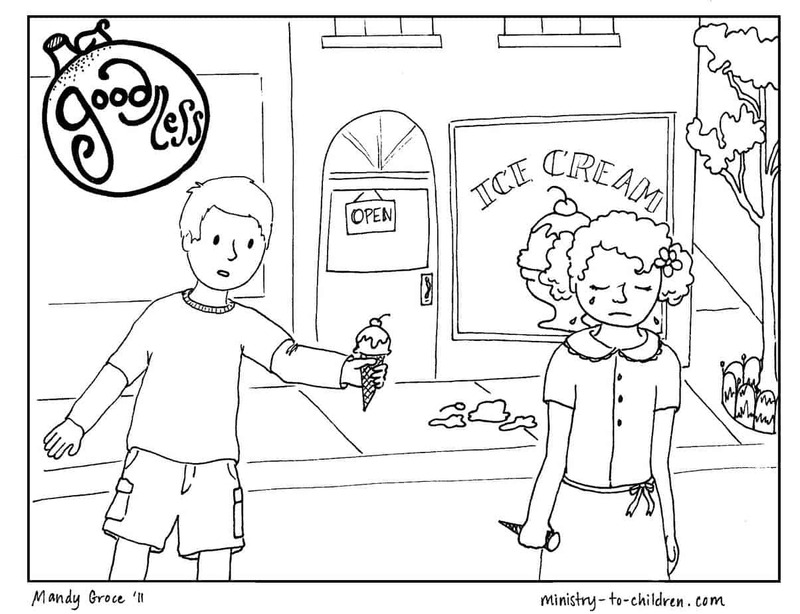 This coloring page about Goodness would be ideal for Sunday School, Kids Church, or at home with your children. Click here if you would like to leave a comment about this artwork. I love this page on Goodness. Thank you so much for sharing. We have just started church-planting and this is perfect for the little one to colour while we as adults talk about the Goodness of God. Tony Kummer (Editor) reviewed & updated this page on : August 27, 2012 at 7:28 pm. All our content is peer reviewed by our readers, simply leave a comment on any post suggest an update.